Home » Uterine Fibroid Articles » What are Fibroids? 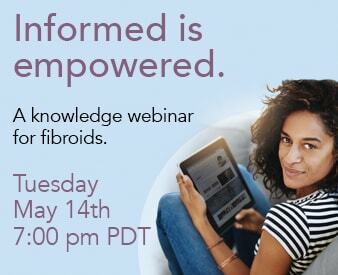 Share the post "What are Fibroids?" Uterine fibroids are non-cancerous tumors in the uterus. Fibroid tumors are benign growths that appear on the muscular wall of the uterus. They are the most common tumors of the body. You may hear them called other names like leiomyoma, leiomyomata, or myoma. They range in size from microscopic to masses that fill the entire abdominal cavity. In some cases they can be as large as a full term pregnancy. They can affect women of all ages, but are most common in women ages 40 to 50. In most cases, there is more than one fibroid in the uterus and consist of dense, fibrous tissue and are nourished and sustained by the uterine arteries in almost every case. They are often described based upon their location within the uterus. Subserosal fibroids are located beneath the serosa (the lining membrane on the outside of the uterus). These often appear localized on the outside surface of the uterus or may be attached to the outside surface by a pedicle. Submucosal (submucous) fibroids are located inside the uterine cavity beneath the lining of the uterus. Intramural fibroids are located within the muscular wall of the uterus.